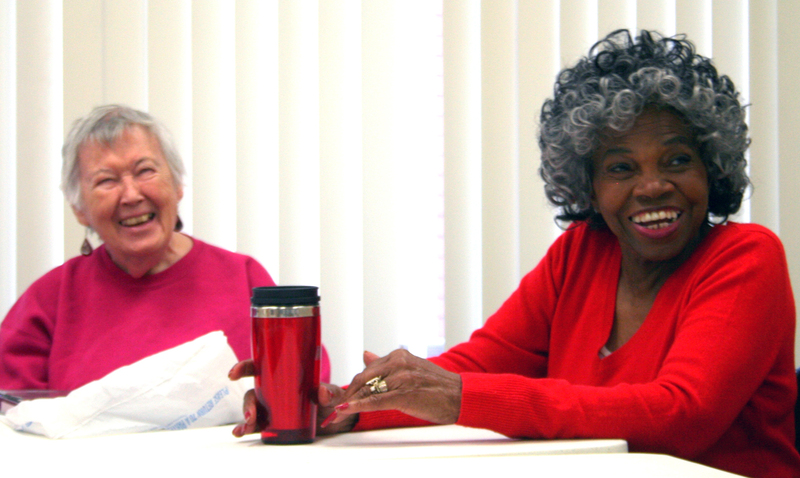 Wanda Huttner (l) and Almetoy King recall the time they were told senior citizens can’t walk backwards. The Players meet once a week at the John T. O’Connor Senior Center, located between Cansler Park and the YMCA in East Knoxville. Participants must be age 50 or older to participate in the Senior Center’s activities.No acting experience is required to join the drama group. Silver Stage Players is and education/outreach project of the Wild Thyme Players. Several of the senior actors have crossed over to Wild Thyme’s productions, like Antigone. Some of the seniors have also completed Wild Thyme’s classes on stage combat and sword fighting. 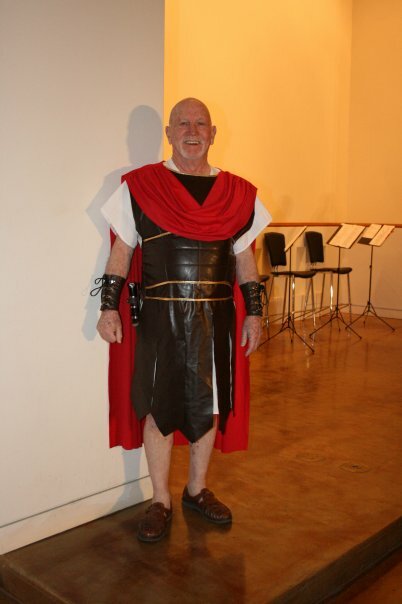 Charlie Stevens performed in Antigone. Photo courtesy of Wild Thyme Players. Wild Thyme’s founding director Brandon Slocum created the Silver Stage Players and authored several plays for mature actors regarding topics of interest to seniors, including post-retirement depression and coping with the death of a spouse. Jeanette Stevens became Brandon’s senior playwright apprentice, and she penned the popular Elder Speak, a short play about mid-life age discrimination and baby talk aimed at elderly patients. When the troupe performed Elder Speak at a health care professionals’ conference, several audience members came forward after the show and admitted they were unaware of the condescending way they were relating to older patients. 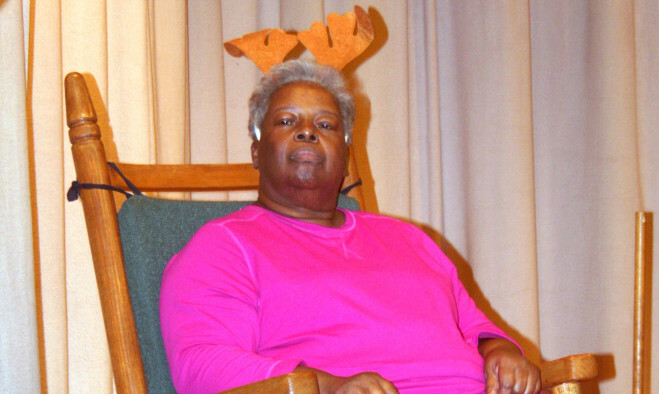 The Silver Stage Players recently performed Jeanette’s lighthearted Christmas play Who You Gonna Call? at the John T. O’Connor auditorium. This performance was the first in a fundraising campaign to help send the Silver Stage Players to a senior theatre festival in Atlantic City in June 2014. Future projects include a 4-week writing and interview workshop beginning in January. In March, at Concord Methodist Church, the Silver Stage Players will perform a short play about an adult daycare center. There will also be some musical performances, and a parody of Little Red Riding Hood. While topics addressing senior concerns can be sad, these original plays are infused with humor. Former director Brandon Slocum’s brother, Greg Daughtry of Tuscarora Films, was so impressed with the Silver Stage Players he began filming a documentary about the troupe. Fire in the Furnace is still in production. For more information about The Silver Stage Players, please contact Carolyn Corley at 865.325.9877. For more information about the John T. O’Connor Senior Center, please call 865-523-1135. If you like this article, you might also enjoy Silver Sneakers.